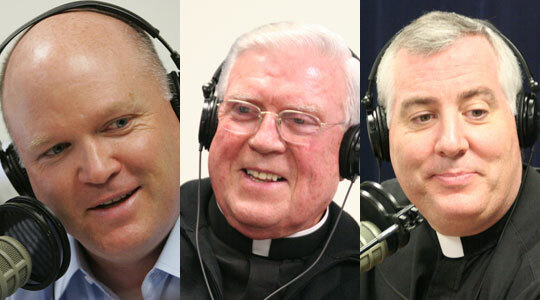 Summary of today’s show: One of the legendary priests of the Archdiocese of Boston, Msgr. Francis Strahan, talks with Scot Landry and Fr. Mark O’Connell about his 52 years in the priesthood, including 18 years teaching future priests to sing at the seminary and 28 years as pastor of one of the largest parishes, St. Bridget in Framingham. Msgr. Strahan also recalls the experience of leading an archdiocesan choir for Pope John Paul II’s Mass on Boston Common in 1979 (and why the choir ended up dyed red), and how on a later trip to Rome, the Holy Father acted as a music critic for Monsignor’s musical performance. 1st segment: Scot welcomed Fr. Mark back to the show and they discussed the end of the liturgical year and Fr. Mark’s busy day. It’s also the last weekend with the old translation of the Missal we use for Mass. Scot said it’s also the weekend for the Cheverus Awards at the Cathedral of the Holy Cross on Sunday at 3pm. They are the unsung heroes of the archdiocese. Scot said one of the legends from within the presbyterate of the archdiocese is Msgr. Francis Strahan. Fr. Mark said all the priests look up to him. 2nd segment: Scot and Fr. Mark welcomed Msgr. to the show. His hometown is Everett, which he calls the Riviera of the East. He’s been a priest for 52 years now. He first heard the call by being inspired by the priests of his parish as well as a nun who taught music. Fr. Bill O’Neill was a great influence. In those days, there were 4 priests in the rectory. Msgr. said his parents were talented musicians and there was always music in his home. They sang a lot in Mass in those days, with singing throughout the Mass even during the prayers of the priest. He spent two years at Boston College and then moved to the seminary. In the seminary, he was in the choir. He eventually did some cantoring and really enjoyed that. After ordination, he was assigned to St. James the Greater Parish in Boston. He was invited to formally study music at the New England Conservatory so he could eventually teach it at the seminary. The parish was in Chinatown and the theater district and garment district, and they had a lot of city ministry to workers downtown. His degree at the conservatory was in voice and conducting and theory. Msgr. Strahan taught full-time at the seminary for 18 years. He said it was a challenge, especially in the late 60s to 70s, with the change of the Mass from Latin to English. Most of the men were very dedicated to the learning. Those who sang in the choir still say that it was an enjoyable time. The Christmas choir was half men who couldn’t almost sing and half who could sing very well. Msgr. Russell Davis was the one who recruited Msgr. Strahan to replace him teaching music at the seminary. Davis had been at the seminary for 18 years himself. Msgr. Strahan taught at both St. John and Blessed John XXIII seminaries. Scot asked Msgr. Strahan how he worked with a seminarian who wasn’t a good singer. Msgr. said he told the men who felt they couldn’t sing that everyone has one note and you could sing any prayer with that one note. Scot noted how he’s heard priests who sung the whole Mass, who didn’t have good voices, but yet it was prayerful and sounded beautiful. Msgr. said when the priest sings the consecration, even with one note, the whole church becomes silent. 3rd segment: The segment began with a soundbite from Pope John Paul II during his visit to Boston in 1979. Msgr. Strahan built a choir of 350 people for the papal Mass. Msgr. said at first they weren’t sure the pope would be coming to Mass to celebrate a Mass. when they found there would be a Mass, they started to think about a choir. They had just had the funeral Mass for Cardinal Wright in August when they heard about the papal visit coming in just six weeks. They had many more than 350 people who wanted to take part. They rehearsed twice a week at St. John Seminary. People would come from business trips in New Jersey for the rehearsal and then drive back to New Jersey. On Boston Common, they had a great sound system and choir stands. Msgr. said the Secret Service people were very impressive and he appreciated working with them. They said their job was made easier by the fact that this was a friendly crowd that would love them. At the cathedral on that same day, the St. Paul’s boy’s choir performed for the Holy Father. While they waited for the Pope at the Common, the choir lead the crowd in song, until the Holy Father appeared and the crowd roared so loud they drowned out the choir. They entitled the Mass: the Mass of Christ the Redeemer of Man. Msgr. Strahan wrote the Mass with some help for accompaniment of orchestra. They sang the Mass in the pouring, driving, windswept rain. They had to give up the instrumental accompaniments because of the rain. Everyone who wore the red choir robes ended up dyed red underneath. One of the songs they didn’t get to sing at the Mass was “Simon, son of John.” Fr. Mark said every priest wants to hear Msgr. sing it. For years it was sung at every priest’s funeral. It comes from the three times Jesus asked Peter if he loved him. It is based on the same tune as the Salve Regina. Fr. Mark said Msgr. still sings it at every priest gathering. Msgr. said of his parish that it’s a great place with lots of people of all ages helping out. He’s grateful for the parish’s food pantry because so many people are in need these days. He’s been at the parish for 28 years now. He said it’s a joy to marry a young couple and to look out and see the parents that he married many years ago. He’s privileged to be part of that cycle. Scot said for many people in that parish the only pastor they’ve ever had is Msgr. Strahan. In their mental conception of the Catholic faith, Msgr. would figure prominently in their faith. He noted how often he sees himself in pictures in the homes of parishioners he visits. 4th segment: Scot said Msgr. Strahan also serves on many committees and ministries on the archdiocesan level. Scot got to know him as chair of the board of the Catholic Foundation. Msgr. said he’s also served as chair of the liturgical commission and the music committee. He’s also been on the pastor’s advisory committee of the Catholic Appeal, working with priests to help them with the work in their parishes. Scot said St. Bridget in Framingham is always one of the top parishes in giving to the Appeal. It’s not only active in Framingham, but goes beyond to help the Church throughout the Archdiocese. Msgr. said each week, 5% of the collection goes out to other organizations that need help. Fr. Mark asked Msgr. how feels about the new changes to the Roman Missal. Msgr. said the only challenges in 1972 wasn’t the change in language, but the change in music. There weren’t many hymns, for instance. With this new change, there are numerous textual changes. He’s given five evening sessions in his parish to show that there’s a certain fidelity to the Latin text behind the changes. He thinks it will still be difficult for people to stop saying the same words they’ve been saying for years. Msgr. said it will also be difficult to sing the changed texts. Msgr. said the choir at St. Bridget’s is a good group of singers, but isn’t a big group because the choir loft isn’t very large. They’ve been working on some new Masses with the coming changes. 5th segment: Now as we do every week at this time, we will consider the Mass readings for this Sunday, specifically the Gospel reading. Scot said this is the Gospel for the Feast of Christ the King and the Gospel talks about service. It is the corporal works of mercy, the key ways we’re to love from Sunday to Sunday. Dorothy Day of the Catholic Worker Movement said we love God to the extent to the amount we love the person we like the least. The reason you see Christ in a person is because they’ve been made in the image and likeness of Him. Fr. Mark these good people Jesus is talking to don’t remember helping someone. They don’t remember because it became just part of who they are. At the beginning it’s a conscious act, but after a while it becomes unconscious because that’s who we are. Scot said there will be those who fail the test as well. Msgr. said there can be a complacency that sets in. He said there will be those who hear the Gospel and ask how they can serve the needs of others, but for those who are physically unable, their prayer is part of serving. Fr. Mark said Cardinal Sean’s new pastoral letter challenges us to invite others to Sunday Mass and that’s another work of mercy. Scot said Cardinal Sean says as an archdiocese we’ve done very well at the corporal works of mercy, but we haven’t done as well at the spiritual works of mercy, like Msgr. just said. It’s through the transformation of receiving the Eucharist, it’s much more natural to do all the corporal works of mercy.